An overland travel adventure may evoke images of uncertainty, excitement, exotic landscapes and a hair-raising one - that was what we experienced when I travelled overland from Iran to the Caucasus and Europe. You see history of the forgotten lands from a different side, and experience a massive region of varied geography - from the Persian empire to the influence of Iran in the South Caucasus. 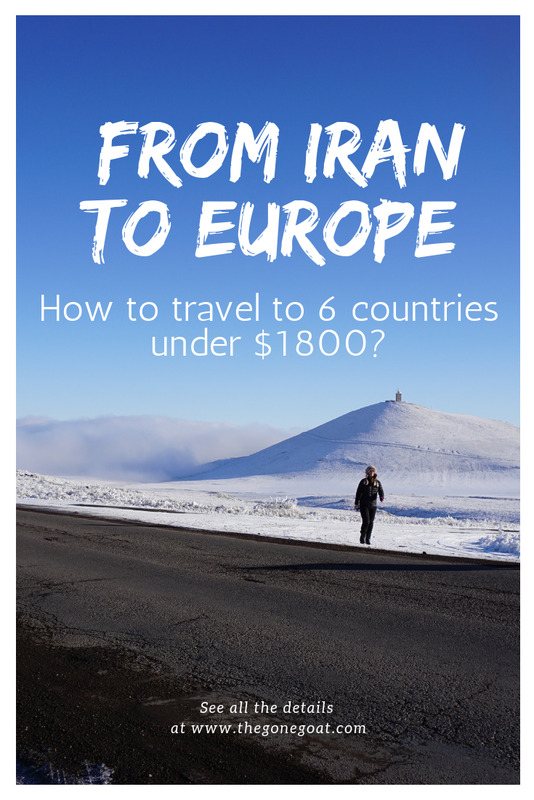 Many people have asked me when I had returned from Iran and Europe after travelling and backpacking for 2.5 glorious months requesting for information: how did I manage to travel on a budget all under $1,800. Was it a cheap vacation or did I blow my life savings? 1) I did travel on a budget, but I still wasn't very calculative with my money and lived largely like a king. 2) A simple budget tracker and cost comparison analysis coupled with a magnifying glass of the world atlas compelled me to find unimaginable, interesting routes. Putting a plan in place is great but with slow travel it is almost impossible to plan. Thoughtful spontaneous events were often far more memorable than the planned visits, providing enough wiggle for me to change my plans at the last minute without sacrificing my budget. I still had to decide my starting point which turned out to be Iran (Read: 10 reason why I travelled to Iran). Many people would often start their Europe trip by spending one month, covering 10 countries and blowing about $3,000 to 5,000 at one go. Time spent in these countries were often a maximum of three days. I often wondered how is it possible for people to spend so little time and so much money, to sum up the great times that they may have encountered. I understand many are on a tight schedule and have jobs, responsibilities are other commitments to served. However, I did not feel like it was justified spending that amount of money for a short period of time and hence started looking at alternative ways to stretch my dollar. Prices were steep for direct flights from Malaysia to Europe. AirAsia at that time had a promotion to travel to Tehran only at $135 (RM 600) for a one-way ticket. A return ticket was expensive, but it didn't matter because I knew I would exit from a different country. Unfortunately, AirAsia had to stop flying to Iran and instead the cheapest options include Turkish Airlines, Oman Air or Emirates. So Iran it was, and I grew excited about the in-between countries seated in the Caucasus region that I could travel to via an overland journey such as Armenia and Georgia. Tickets to Europe from Georgia were dirt cheap and because it was December, I thought it would be wise to book an advance ticket from Tbilisi, Georgia to Madrid, Spain and rightly so, it was priced at 100euros (RM 450) for a 10 hour flight with Pegasus Airlines. Since flight tickets were sorted for the first leg of the trip, let me break it down to you what was the best way to travel overland on adventure from Asia to the Caucasus, and Europe. Take a metro from Tabriz to Jolfa, on the border with Nakhichevan, an enclave of Azerbaijan between Armenia and Iran and then on to Nordoz, the border. Travelling in Armenia is hard and hitchhiking is really tough. Travel In cities in Georgia is easy with the old rickety soviet-like metros. I started my trip in Iran with a plan to use Couchsurfing, and a combination of hostels, lodges and homestays to keep my budget intact. The rest of the trip followed the same principle and it was really quite something because these were some of the best places to travel and stay in. Where To Stay In Armenia? Each hotel / hostel costs around $8 - $10. We stayed in some homestays and I can't quite remember the name of the places but here were some of the best finds. Where To Stay In South of Spain? Couchsurfing: If it wasn't for my kindest hosts in Iran, Georgia, Belgium and France, I would have been lost. We discovered some pretty cool places and met the most kindest souls with interesting stories. Maps.Me: Fast, detailed and "offline" maps all at one go. I bookmarked so many places and it had everything to help you with that even while writing this piece, I had to refer back to the map to review the locations I visited. Booking.com: From B&B's to guesthouses, we all know how Booking.com works and this is a must-have app. Google Translate: I lost count the numerous times that Google Translate had helped me especially in Iran and Georgia. From "I know where your address is" to "I know you're blood" in Iran and lost in translation in the mountains of Svaneti in Georgia. I love walking so that's what I did - walk or take the metro. Taxis and car pool rides only happened when I had too much luggage but I am mostly a light traveller. Hitchhike only in places where you think it's possible and feels comfortable. I decided to do so in Iran and Georgia. Because I was couchsurfing, and as part of the whole culture exchange, I would usually try and cook for my hosts as much as possible. Not a fan of sightseeing and visiting museums unless they’re pertinent in discovering the history of the place. In Iran, I was very selective about the places that I wanted to visit and in Europe, while there are plenty of art galleries and museums, it was X'mas and New Year's time so it was hard to visit places and instead I chose to explore the various Christmas markets. In short, travel need not be expensive if you lock down a budget, focus on the places that you'd ideally like to visit, and don't get too stressed with the cost issues, you'll be fine. Skip the articles that tell you about the places that "you should" travel. There are no right or wrong ways; I feel you should only go to places that you truly want to go to and not fall into this romanticised notion just because X person had written great things about it. Is there a route you think many people may not know about? Let me know in the comments below on the travel routes that you thought were interesting. A little disclaimer: there are affiliate links in this post. if you check out the links, and decide to make a booking, feel free to do so at no extra costs. This is how I pay to keep the blog running and I'll forever be grateful to you.